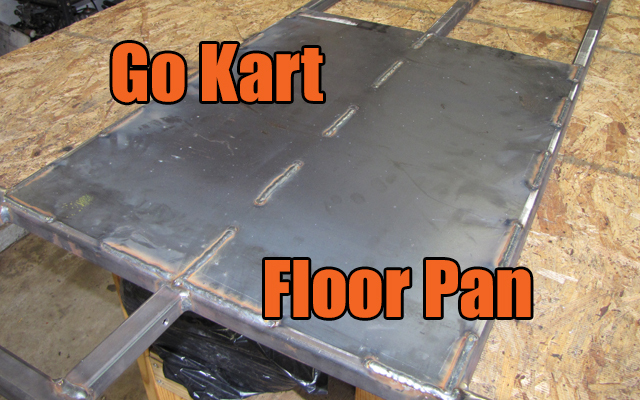 The next step in building a go kart frame is the floor pan, which is a thin sheet of steel that protects you from the ground and provides a nice resting spot for you and your friend's feet. 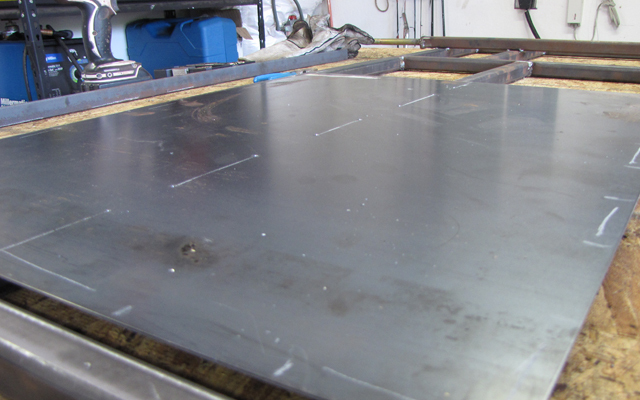 The go kart floor pan material is just your standard mild steel that has a thickness of 16 gauge, or about 1/16″ thick. This is the perfect balance of weight and strength. 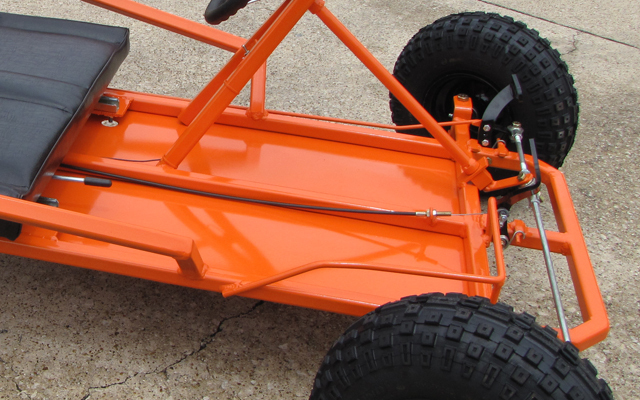 The dimensions for this go kart are found in the go kart plans for the floor pan, which is 26″ x 20″. 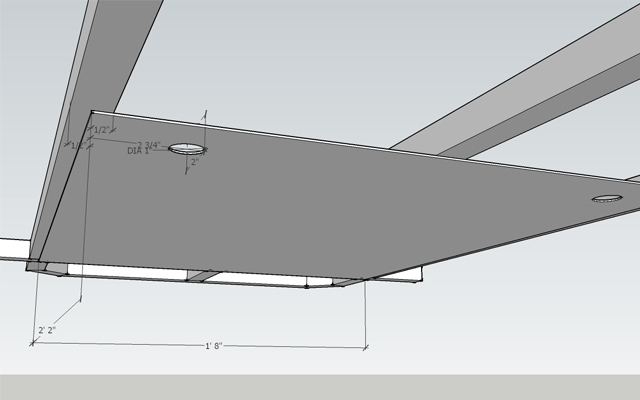 The floor pan is designed to have 1/2″ of frame overhanging on each side, including the front axle tube. This is where you want to position the go kart floor pan, which lines up perfectly with the center-lines of the outside edges of the frame, as well as the go kart’s front axle. I marked the areas on the floor pan that I also wanted to stitch weld. I made a few cuts down the center line of the floor pan for extra support when welding. I knew this would cause minor warping, so only do this if you want the extra support. A good tack toward the rear of the kart in the center beam of the frame should be enough. A word on warping. If you tack alternating opposite corners and sides of the go kart’s floor pan, you will equalize warping and literally stretch out the floor pan (which is what I was trying to accomplish). I feel like I added too many tacks that were too close together and welded on too high of a heat setting. The result was a very small arch in the frame which actually helps it support more weight (think bridge arch). So if you want to do this and get that effect, copy it exactly. If you want to minimize warping, do a low amperage setting with about a 1″ stitch weld every few inches (maybe 4 stitches on the 26″ side, and 3 on the 20″ side. 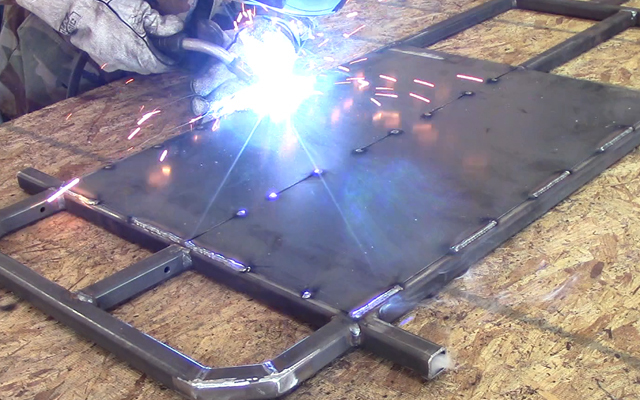 You can really space the tacks out to minimize warping, and not bother welding in the middle of floor pan. Two holes need to be cut on the end of the go kart floor pan for the seat mounting bracket bolts to be installed. Mark a point that intersects at 2 3/4″ in from the edge of the floor pan’s 26″ side, and 2″ in from the 20″ side. Do this twice. Now that you have the floor pan finished, it is time to install the clutch, engine, and engine mount. Keep up the hard work, you are making a lot of progress! Just stay focused and take it step by step. any 6.5 hp industrial 4 stroke engine with a straight 3/4″ shaft keyed to 3/16″ will work. in this case, the engine is a predator 212cc. 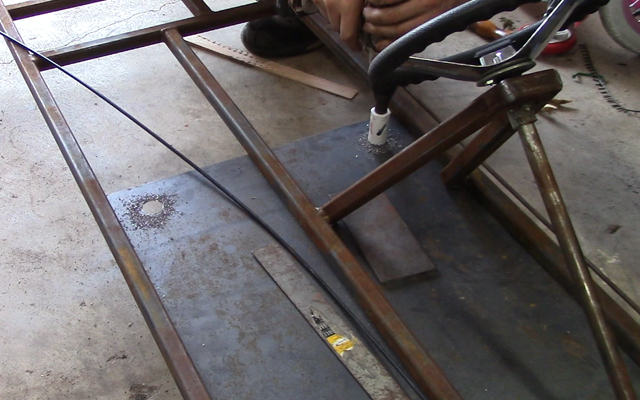 For all the “No Welding” people, sorry but that’s the safest and most reliable way to put a kart chassis together. You can get an inexpensive wirefeed Fluxcore or MIG (shielding gas) welder from several sources that will do fine – you just have to work in short bursts within the duty cycle, allowing cooldown time. If you can, go MIG and get a bottle (Or two – use one, fill one) of CO2 shielding gas – it’s worth the slight premium for much cleaner work. The exact engine they are using can be foun on amazon foe 115$ up to 180$ depending on what quality of engine you buy. the lowest one is just fine, but the highest has 9 horsepower and an electric start engine. Have you ever tried attaching floor pan with self drilling screws? I dont have access to a welder and have a budget restoration. I have only seen tabs welded to frame to bolt floor pan to it. google ‘steel distributors near me’ any metal supplier will have steel, and you tell them the dimensions and they shear it off for you so you don’t have to cut it. yeah, just look at the links, it has a plans link and you click on it there and it opens a pdf.